DOWN BY THE RIVER A model of the Russian River beckons a young visitor at the Children's Museum of Sonoma County. Fifteen years ago, mother and Petaluma native Collette Michaud encountered the age-old question: "What to do with the kids?" There's a lot of ways to kill some time, but Michaud wanted her two young sons to engage in meaningful activities. That's when she heard about Sausalito's Bay Area Discovery Museum, a place that sparked imaginative thinking and highlighted the natural wonders of the bay. "I fell in love with the Discovery Museum," says Michaud, who was immediately taken by the museum's engaging exhibits. Soon she started looking for ways to bring that same experience to Sonoma County. "There was something in me saying it's going to happen [in Sonoma County], and if you don't do it, someone will. So it might as well be you," Michaud says. "But it has become so much bigger and better than I could imagine it would be." In 2005, she and a small staff started a mobile museum that became popular in schools and parks throughout Sonoma County. For Michaud, that was the first step in establishing a permanent space. Michaud's vision finally found a home in 2010, when Jean Schulz gifted the Children's Museum of Sonoma County a 30-year lease on the 4.2-acre property adjacent to the Schulz Museum in Santa Rosa. As the lease was being negotiated, Michaud and her staff were also applying for a grant to make use of the outdoor space. After an impassioned presentation, the California Parks and Recreation Department awarded the museum $1.8 million for an outdoors exhibit. "I wanted it to be a garden first, as opposed to an exhibit with outdoor features," says Michaud. The garden's theme revolves around the life cycle of the butterfly, and taking the Spanish name "Mariposa," the space is called Mary's Garden. "I always wanted to have a creek with natural features that show what makes Sonoma County special," explains Michaud. Today, a 60-foot-long recreation of the Russian River centers the garden. Inside, the museum's Ella Art Studio and Dow Events Center cater to children 10 and younger, though parents are able to enjoy and engage as well. The museum went full-time last June, and is still raising money to finish the space, with an $8.3 million capital campaign nearing completion. Next month, the museum hosts its annual "Time to Wonder" luncheon on Sept. 18 to help raise funds for ongoing programming. For now, Michaud is focused on completing the museum's next phase, the indoor Science and Imagination Gallery set to open in 2015. 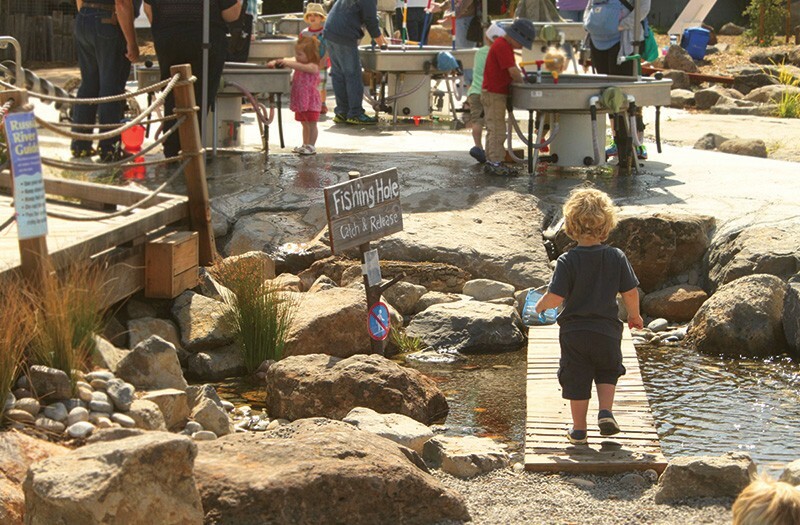 The character and flavor of Sonoma County will be highlighted once more in a main street exhibit that offers kids and parents more ways to engage in meaningful fun. The Children's Museum of Sonoma County, 1835 West Steele Lane, Santa Rosa. Tuesday–Saturday, 9am–4pm; Sunday, noon–4pm. $7. 707.546.4069.